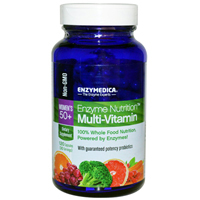 Enzyme Nutrition for Women 50+ contains Enzyme Activated Nutrients™ (EAN) as part of a whole food matrix. It is personalized to meet the unique needs of today's women 50 and up. Each ingredient is grown to preserve the highest potency of enzymes contained within the food structure. Additional enzyme blends (Thera-blend™) further enhance the utilization of vitamins and minerals, ensuring the products are easily digestible while maximizing support of heart, brain and bone health, as well as daily antioxidant support. 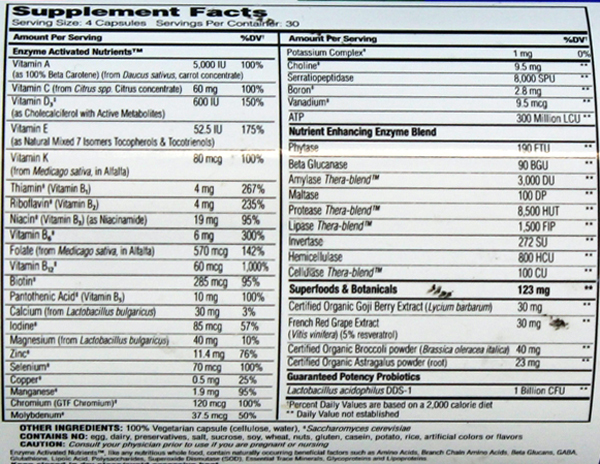 Enzyme Nutrition™ is the only multi-vitamin -- powered by enzymes! Recommended Usage: Take two capsules twice a day for best results. If preferred, four capsules can be taken anytime during the day, even on an empty stomach. casein, potato, rice, artificial colors and flavors.